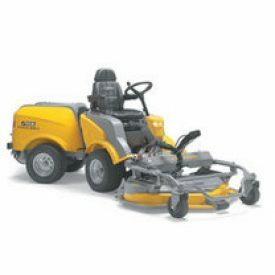 The 4WD Stiga TITAN26H front deck rider is designed for the professional, whether you are looking after a large estate, caravan park, hospital or golf course, it provides you with a tool that can manage large areas effectively and quickly. Powered by a three cylinder Yanmar 26hp, water-cooled diesel engine, the Stiga TITAN26H is clearly on top of the job; the extra power allows us to fit larger wheels and achieve a transport speed of 24 km/h, as well as better ground clearance for difficult conditions. It comes with hydrostatic transmission, which allows for easier control in obstructed areas. In simple terms using it is similiar to driving an automatic car; the more pressure you put on the foot pedal the faster you will travel, releasing the foot pedal will slow you down, allowing you to remain in complete control at all times. Its articulated steering system ensures that wherever you go the rear wheels will always follow precisely in the track of the front wheels. The hydrostatic transmission, coupled with it articulated steering system, makes the Stiga TITAN26H a highly manouverable machine. Ergonomically placed controls, adjustable high back comfort seat with arm rests and hydraulic power steering add to the driving experience. Equipped wih a 135cm Multiclip Combi deck, it will produce a perfectly clipped healthy lawn in wet and dry conditions without the need for collecting It can be safely lifted without the need for any tools, so that they can be properly cleaned and blades checked. The Stiga TITAN26H is also an extremely versatile machine. Its Multiclip system recycles grass clippings, turning it into fertiliser for your lawn, while its rear discharge option deposits the clippings behind the machine. This is an appropriate alternative to employ when the grass is long. Also easily adapted for snow clearing, sweeping and moving material around your site without compromising its excellent grass cutting performance. Blade Engagement Electromagnetic Clutch Wheel Sizes Front 20"
Easy controlled from the drivers seat, with a lever or by pushing a button.